Innovative tech features in cars are now so common that most of us expect them, even in the most basic cars. The Ford EcoSport offers lane-keeping and adaptive cruise control; many new cars have a backup camera. It’s almost a little boring to think that autonomous steering is now available in at least five different models – from Nissan to Cadillac to Tesla. And then along comes the 2019 Volvo XC40. This is a car that would appeal to the tech elite, those who want to try out features that are not widely available. First up – you can drive the XC40 without owning a key. We weren't able to test the feature because it's not available to journalists and you have to actually own the car, but using the Volvo On Call app, you can grant access to another driver or even to yourself to drive with a somewhat mysterious “red key” that always stays with the car. We tested the app as much as possible, however – even if we didn’t have the red key. The concept is a clear sign of what’s coming with automated driving. You can grant access to a teen driver for the day, or to a friend, then monitor the location of the car in real-time. Another innovation has to do with the Care by Volvo program. 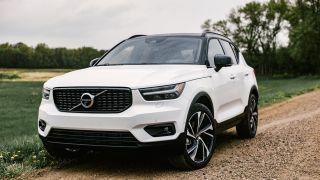 Again, it’s not possible to test in a real-world setting, but the XC40 we used is the exact same model you can “subscribe to” (aka, rent) for a month at a fixed price of $600 for the Momentum trim and $700 for the sportier R-Design version we tested. How is it different from renting or leasing? Good question. Volvo says there are no hassles about upcharges, and it’s a flat rate available everywhere no matter which state (even Alaska). And, you can do everything from the app. “It is different from rental in that this vehicle is your own personal automobile,“ says Nichols. “It is new and not shared in a pool with others as other OEM programs. Regarding comprehensive service, the servicing such as wiper blades etc. would still be handled via the normal Volvo service program at the retailer. A subscription is a sign of how we’ll drive cars in the future, without a key and presumably without the hassle – renting them will work more like buying an iTunes movie. Well, that’s the dream anyway. We wondered about what happens when you go over the allotted miles of only 15,000 per year. Damage to the vehicle? While Volvo says the insurance works the same in every state on a flat rate, we wondered about scuff marks or other light damage. These are the same issues we’ll have to deal with when we can send cars out like an Uber to drive people around autonomously, or when we ask the car to drive us home. If the robot is driving, who is liable for the insurance? It likely won’t be Volvo, but maybe it could be. For now, it’s amazing to think these features are so fluid – the apps are easy to use. Lincoln and Audi offer similar services to borrow a car (with Lincoln, it’s when you get service). Still the pricing is not outrageous – a $20 per day rental car costs $600 per month. We do have to mention a few other interesting perks in the XC40. The car has a wireless charge pad tucked away under the main console. There are compartments everywhere. The car has a trash can you can remove – it sits next to the armrests. A tissue box fits perfectly into the compartment between the seats, and there’s a hook you can use on the glove box to hang take-out food. And, the car is just a joy to drive – sporty and subtle around corners. For anyone who likes “firsts” in technology the Volvo XC40 is a good choice. And, it’s certainly a clear indication of where automotive tech is heading (with a few caveats along the way).